It begins where The Robe left off! Rome, soon after the death of Christ. The depraved and mad Caliguila is on the throne, obsessed with two things: the Robe, the garment that fell from Jesus shoulders on the cross, and a brutal gladiatorial displays. Victor Mature is the devout Christian entrusted with the Robe by Peter (Michael Rennie). But he turns his back on God, enters the arena, and becomes the most famous gladiator in Rome. Sharing the bed of the powerful and diabolical Messalina (Susan Hayward), he may even betray the Robe and any hope he has for redemption! Funny how many “modern concepts” in film actually have been around for decades. The idea of shooting a sequel right after – or even during – production of a film still seems risky today, but it must’ve been even more daring 55 years ago. That’s when the suits at Fox decided to greenlight 1954’s Demetrius and the Gladiators, the follow-up to 1953’s The Robe. Gladiators begins right after the finish of The Robe. Roman Emperor Caligula (Jay Robinson) seeks the robe of Jesus that was the focus on the first movie. He thinks it boasts magical powers and desires it for himself. Former slave Demetrius (Victor Mature) holds onto the robe and conceals it from Caligula’s men. When he ends up in front of a tribunal, he can’t prove that his master freed him, so they sentence him to service as a gladiator. This sends Demetrius to a training camp operated by Strabo (Ernest Borgnine). Due to his Christian beliefs, Demetrius refuses to fight – which means Messalina (Susan Hayward), the sadistic wife of Caligula’s Uncle Claudius (Barry Jones), insists that he enter the arena the next day. We follow Demetrius’s activities as a fighter and his quest for freedom. When I first heard about Gladiators, I assumed it’d be a cheap cash-in project. After all, it seemed clear that it existed for basic monetary reasons. The folks at Fox spent so much money on The Robe that they felt it made sense to extend their investment with a quickie sequel. To my surprise, Gladiators actually offers pretty decent entertainment. To be sure, it does feel like the bargain basement little brother to The Robe, but not to a terrible degree. Both use the same sets and many of the same actors, though they feature different directors; Henry Koster helmed the first film, while Delmer Daves leads this one. Despite that change we get a fair sense of continuity between the two, and the sequel doesn’t feel like a huge drop-off in quality. It probably helps that Robe wasn’t exactly a great film. Oh, I liked it, but that was mostly due to a strong lead performance from Richard Burton. Otherwise it offered fairly ordinary Biblical material and didn’t present a particularly dynamic affair. Without Burton onscreen, I figured Gladiators would fall flat. However, it works fine in its own right, probably because it doesn’t attempt to simply retell the first story. That’s the problem with many sequels: they do little more than rehash their predecessors. Without the first movie’s lead character, Gladiators really does branch off on its own path. Whereas The Robe was a Biblical tale with a smattering of action scenes, Gladiators offers a fight movie with a minor Christian theme. The flick likes to pay lip service to religious concepts, but it doesn’t really invest itself in them. Instead, it prefers the old “sword and sandals” approach, and in that regard, it satisfies. Without a doubt, Gladiator fans will see a lot of similar material here. Although Ridley Scott and company took their most obvious cues from Fall of the Roman Empire, you’ll find more than a few sequences here that match well with those in the Oscar-winning film from 2000. And that’s fine, as Gladiators concentrates on the more enjoyable material. Essentially a collection of fight scenes with a bit of romance, melodrama and light religion interspersed, this one never threatens to become deep or terribly memorable. However, it offers pretty good entertainment and it keeps us occupied. That should count for something. Demetrius and the Gladiators appears in an aspect ratio of approximately 2.55:1; the image has been enhanced for 16X9 televisions. Yeesh – what an awful transfer! Problems affected virtually all aspects of the image. Sharpness never became better than lackluster. Some shots displayed acceptable definition, but the majority of the shots were soft and fuzzy. I can’t think of a single element that displayed genuinely good delineation. Jagged edges and shimmering failed to make a negative impact, but edge enhancement was a constant distraction. As were print flaws. Throughout the film, I saw frequent examples of specks, marks, nicks, blotches, debris and other defects. Grain was extremely heavy as well. This resulted in an awfully messy presentation. Colors fared better than the other areas, but the grain dulled them to a degree. I felt the hues were acceptably full but they came across as less vibrant than they should due to all the grain. Blacks were reasonably dark, but shadows tended to be dense and thick. Few strengths occurred here, as the majority of the film looked ugly. At least the Dolby Digital 4.0 soundtrack of Gladiators fared better. The mix opened up the soundfield to a decent degree. Music showed good stereo presence and imaging, and we got a fair amount of localized speech. Various effects cropped up from the sides as well, but these weren’t especially impressive; they added moderate breadth to the presentation, though. The surrounds remained fairly passive. They may’ve brought a bit of scope to the piece, but don’t expect much activity from them. Quality appeared good for the film’s age. Speech was fairly natural, as only a little edginess marred the proceedings. Effects lacked much oomph but they seemed clean and clear enough. Music worked best, as the score showed reasonably good vivacity and smoothness. At no point did this become a great soundtrack, but it satisfied given its age. Don’t expect much in terms of extras. We get trailers for Gladiators in English, Spanish, French and German. Under “Fox Flix”, we also find ads for Titus, The Longest Day, Patton, A Midsummer Night’s Dream and The Last of the Mohicans. 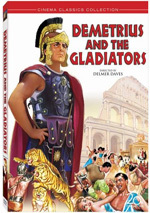 A perfectly respectable sequel, 1954’s Demetrius and the Gladiators offers a good piece of entertainment. It lacks the strong religious bent of its predecessor, but it gives us enough vivid action to keep us interested. Although the DVD provides good audio, it presents dreadful picture quality and includes only minor extras. I like the movie itself, but this DVD disappoints.